There were 8 of us in the group this year. 5 from my home town of Sarnia, one from Granton and two from Stouffville. We all headed up to the Opeongo access to get our Water Taxi at 1:30 p.m. 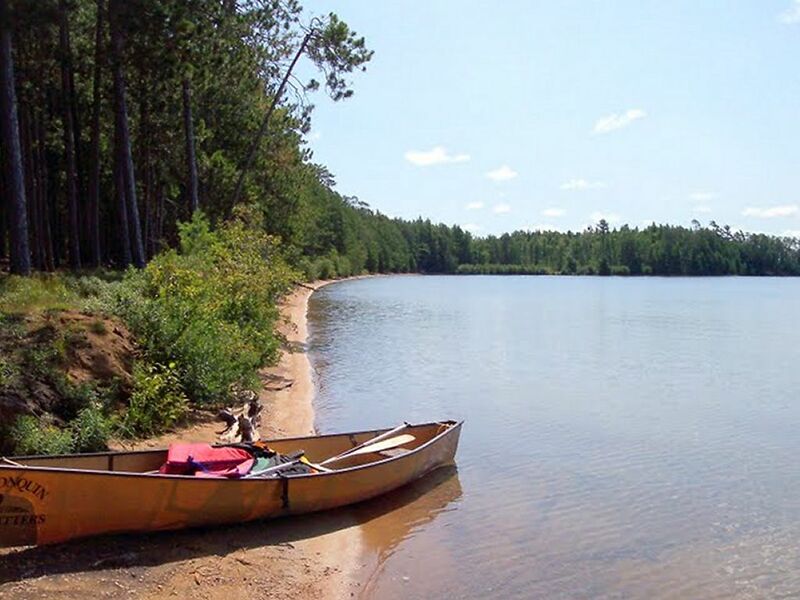 Permits were obtained, canoes were rented (Algonquin Outfitters) and we were off! We were able to leave about 15 minutes early. 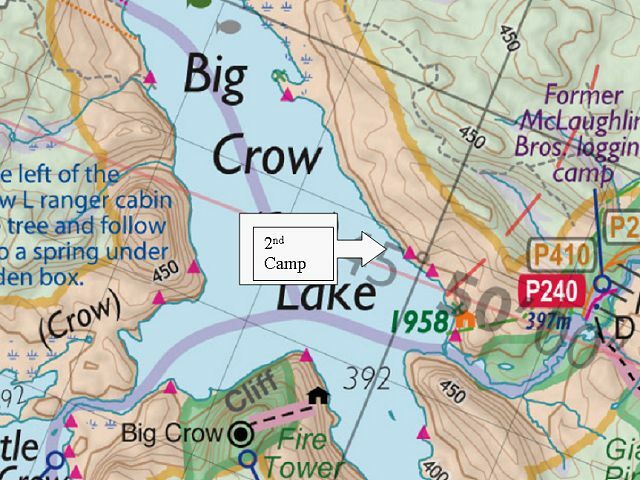 Our first night was going to be on the north arm, so we just had the taxi do a quick search for an open campsite. 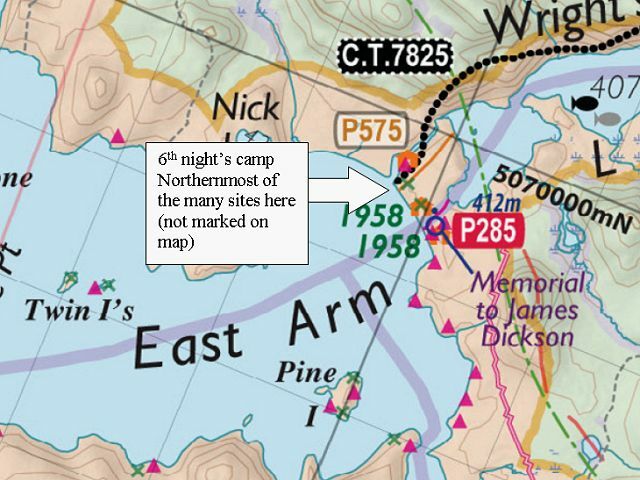 It was busy and after checking the many site on the north shore, we ended up with a dark site on a point close to the Proulx portage that we would be taking tomorrow. It had a very poor take-out but we found it had plenty of tent space once we got into it. 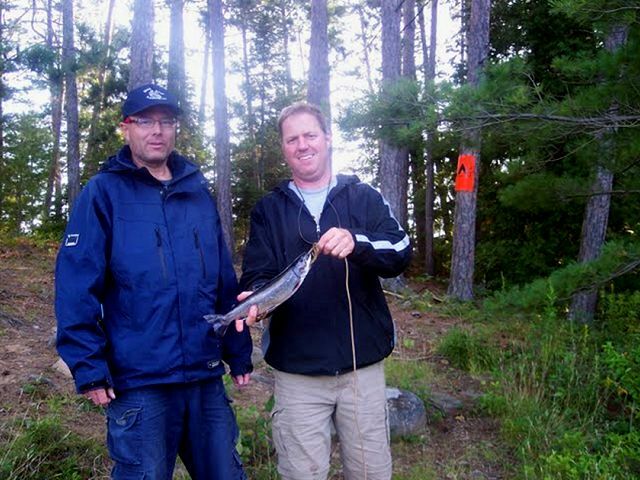 We played a couple of poker games, had some great hamburgers and had a drink to another Algonquin adventure! 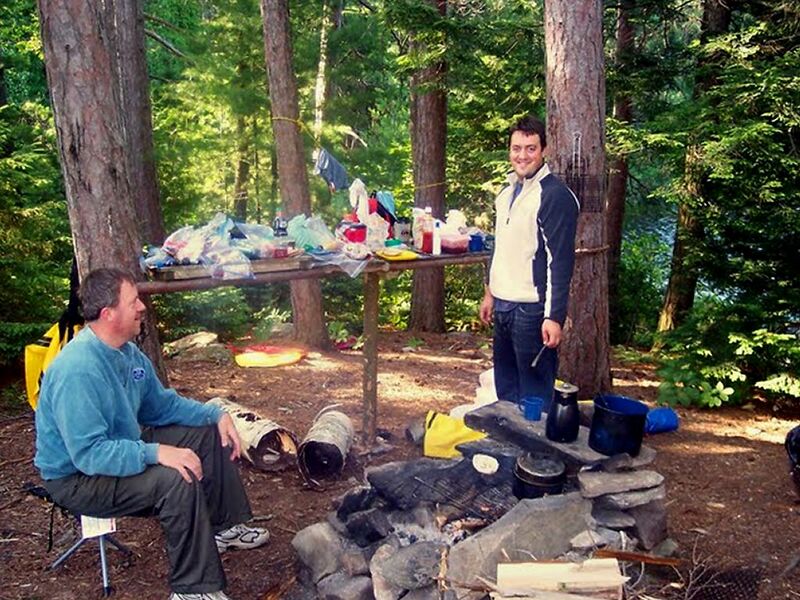 The take-out at our camp on the North Arm. View of our North Arm site from the fire pit. 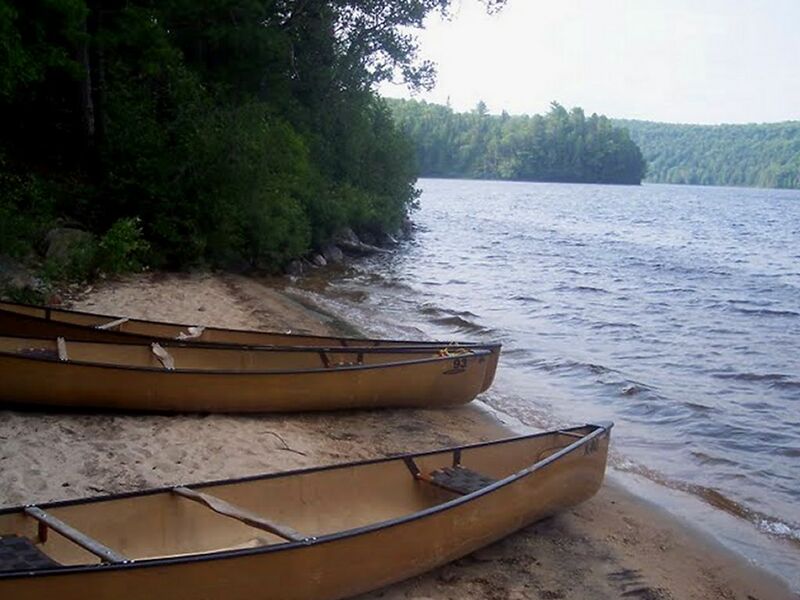 We took the short paddle to the portage and proceeded to carry over to Proulx Lake. The portage was fairly flat except for a hill to get round the small unnamed lake in the middle of the portage. My son and I actually missed the cut off around this lake so we actually did the short paddle! It was only maybe 300m and very buggy! We were disappointed that we didn't see any moose at all on the Crow River. The paddle was nice however, and we made good time getting through Little Crow Lake into Big Crow. 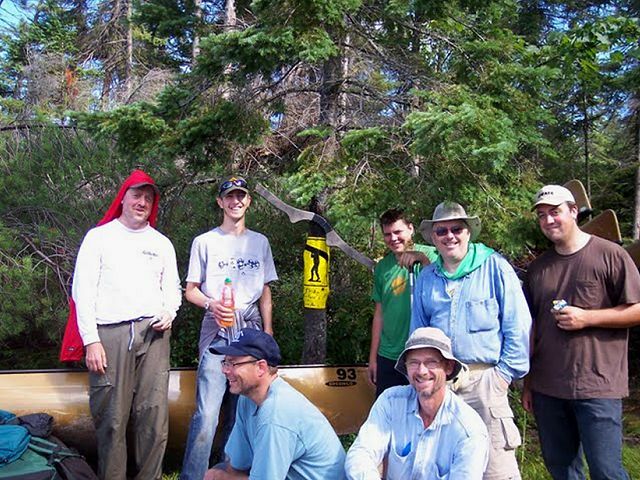 We had 4 canoes so we sent out some scouting parties to look for the best site. One pair went to the Ranger Cabin and got us 20 liters of water from the spring there. 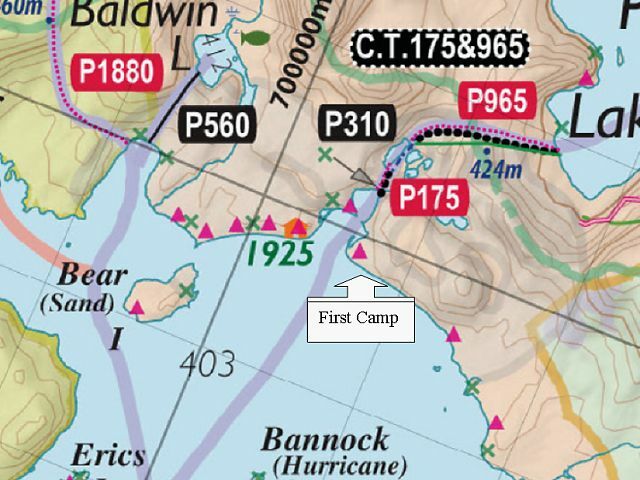 There is a good site to the south of the cabin on the opposite side of the lake but we settled for the Northern beach site. All three of the sites north of the Crow River are connected by a trail. We met both of our neighboring parties, one from Kingston and the other from Baltimore. The site is quite nice, with a "kitchen" shelf and some benches. We didn't want to paddle into the wind to go back to the fire tower, so we hunkered down and spent the afternoon and evening playing cards and enjoying a penne and sausage dinner. We knew this was going to be a tough day. We started the trek down the Crow River, towards Lake Lavieille and were prepared (we thought) for the multiple portages. There was nothing particularly challenging about any of the portages. There were just lots of them, with winding river-paddling in between. We also had thunderstorms chasing all around us all day, but we managed to come out unscathed. The put-ins and take-outs are all what you would expect on a river .. rocky and uneven. You also get a little sick of the "in-the-canoe / out-of-the-canoe" routine near the end of the river. We were all quite tired by the time we reached Crow Bay. And there was still a good paddle ahead to get to Lavieille. Water levels were quite high. If they had been lower, this trip would have taken much longer. For us it was about 6 hours. When we reached the group of campsites at Lavieille, the first one did not look great and the 2 on the north of the opening were taken. So we went to the site on the south point. 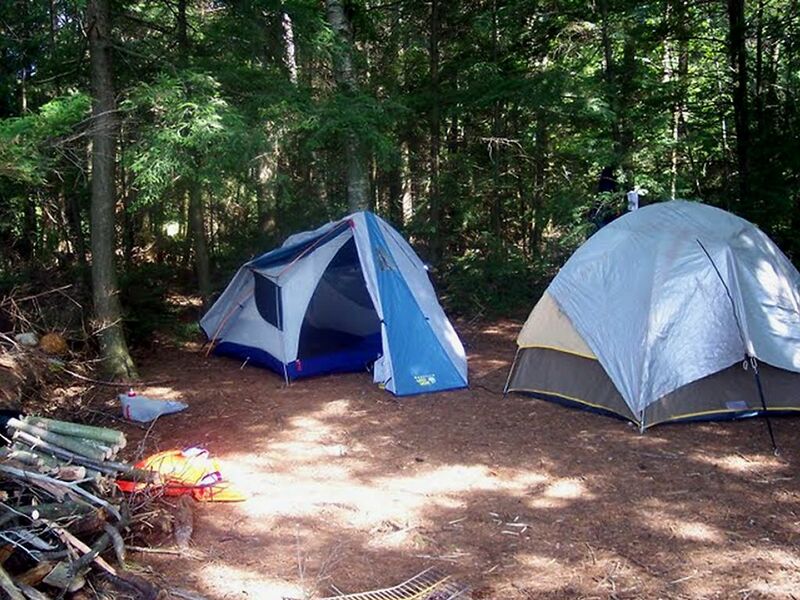 What a great campsite! 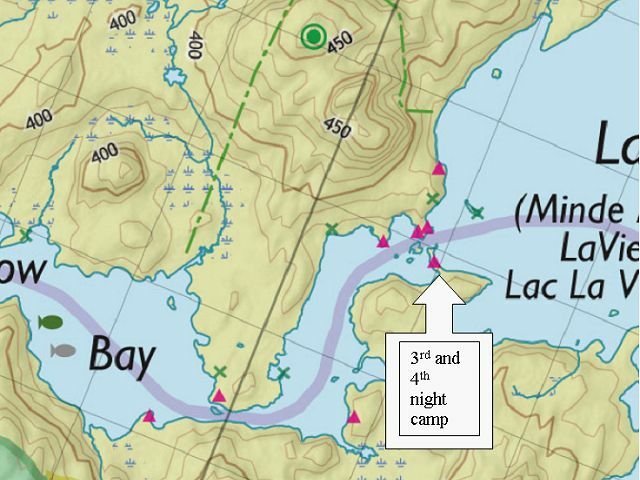 It had plenty of roaming space with good tent sites, rock porches on the east side to face Lavieille and the west side facing Crow Bay. And, it had a great fire pit area with a shelf. The view of Lavieille to the east was spectacular. Very pretty! This would be our stop for two nights, so we were glad we had a good site. We only caught one spec and had it for a snack. Basically, this was our chance to just kick back in the wilderness. 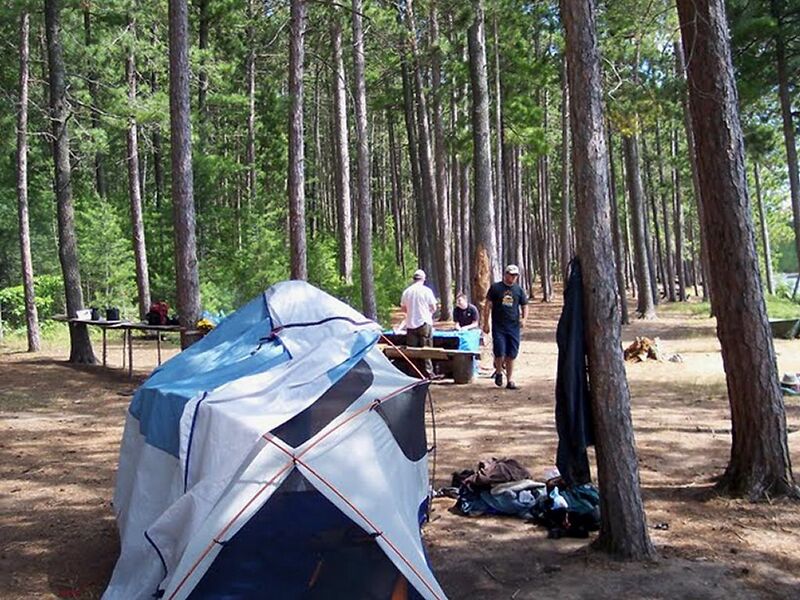 3rd and 4th nights' campsite. View from the Lavieille campsite. It was a 15 k paddle today down the length of Lavielle to Dickson. The morning was beautiful and we had flat water to start. It was hard to leave such a pretty lake, one of my favorite spots that I have been to in the park. We wanted to get as close as possible to the start of the Dickson / Bonfield portage, that we would start the next morning. 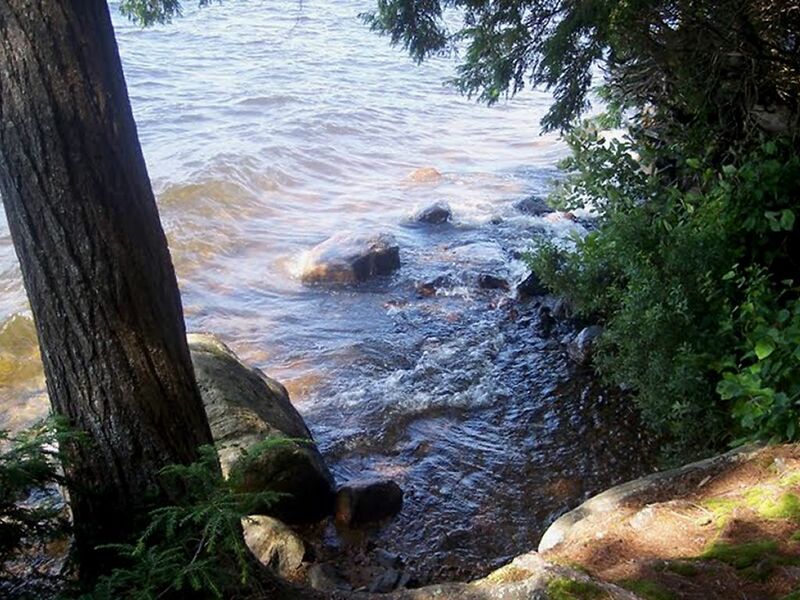 As we arrived at the inlet that leads to the portage, we passed a campsite that was perfect. 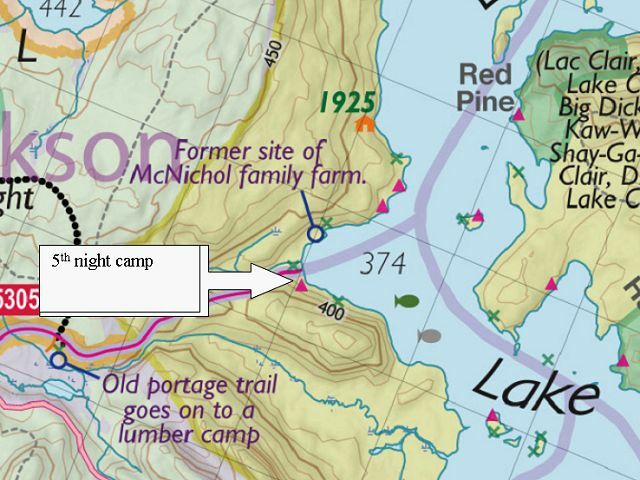 But some in the group wanted to look at the site that was located right at the start of the portage. If I was to do this again, I would stay at the site that we passed. But the group majority decided to stay on the portage site. It was pretty basic. I think it is designed more as an emergency site for someone coming out of the long portage too late in the day to venture into the Lake. We decided to carry the canoes (3 of the 4) down the portage to lighten the load for the next day. I would not do this again either as it is a long walk. It took six of us carrying the 3 alternately. With the ultra light canoes it was an easy carry but, as mentioned, it's a long way! The walk back seemed to take forever and I don't like the feeling of walking back along an entire portage. I would have preferred to take everything at the same time with frequents breaks, but doing it only once. When you travel with a larger group I guess you have to go with the majority! We took about three hours to take the canoes to the end and walk back. That's 10,600 meters of walking. The trail is in great shape with only a few sections that are rocky. 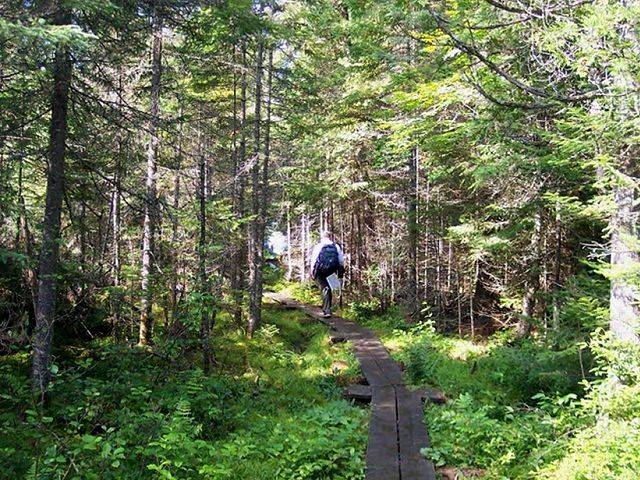 There are lots of boardwalks built over the difficult sections. The only real challenge is the length! Then the rain came. It started just as I was cooking dinner and made things difficult. We set up a tarp but eventually just headed for the tents. I was laying down at about 7:30 p.m. and eventually just went to sleep. My son and I ended up spending about 11 hours in the tent! (well it is a vacation! Lol) The rain was on and off all night but no thunderstorms came. Unfortunately I don't have pictures of this site because of all the wet weather. Today was the day we took the rest of our possessions across the Dickson / Bonfield portage. One advantage to walking the portage the day before was the awareness of how long it would take and the various "markers" along the way. We were using Jeffrey's map as a reference. The map did not reflect what we felt were the true distances between these markers. 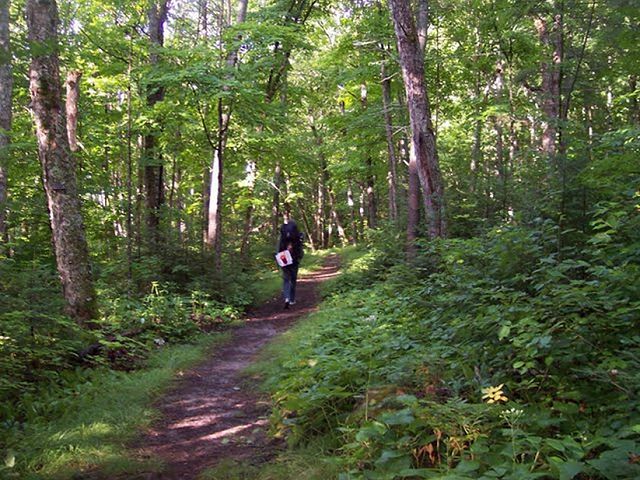 This may be due to other circumstances (like the terrain - or how tired we were) but we felt that the cart trail cut off was about � of the way down the trail and the road was about � of the total. The map shows it quite different. I don't know if anything has changed or not? We finished the portage in about 90 minutes. Near the start of the Dickson / Bonfield. We then paddled and portaged through Bonfield and Wright's Lake to get to Opeongo. Nice little lakes. One of our canoes stopped to fish in Bonfield and caught a bass. 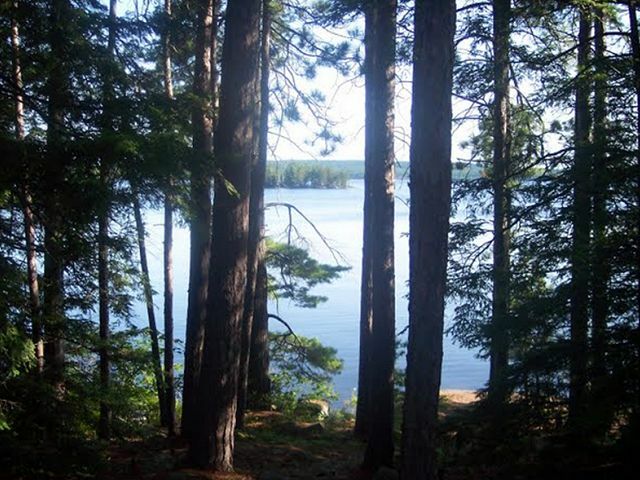 When we arrived at Opeongo we saw that there were numerous campsites right at the end of the portage extending north to the end of the cart trail. This whole area is very open with abundant tall pines all around. We went to the 2nd site south of the cart trail exit. It was a fantastic site with a great beach but had the potential for many very close neighbors during busy times. 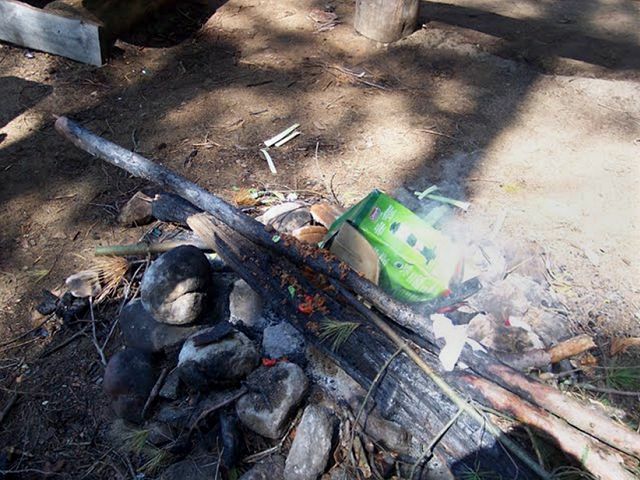 Unfortunately, the previous campers had left the site in quite a mess, with strewn garbage and a fire pit full of old food and containers. It's hard to explain some people actions. We even saw live trees with large hatchet gashes in them. Also, the Dickson memorial that was close by has been vandalized. The plaque is missing and many of the rocks have been pulled away. We had a great last evening in Algonquin and enjoyed a KD dinner and a wee bit of Scotch. The water taxi was coming tomorrow at 8:30 a.m. to pick us up. What was left in the fire pit for us. The beach at our East Arm site. The water taxi was early and arrived at the East Arm at about 8:05. He was scheduled to pick us up at the portage but spotted us right away at our site and got us there. We were on the way at 8:20 for a cold, quick rise back to the access point. All that remained now was a hot shower, a change of clothes and a 6 hour car ride back to Sarnia.